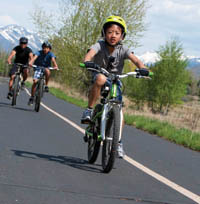 The first half of a $3.5 million, two-year project to resurface the Wood River Trail bike path is scheduled to begin during the first week of June and last until about the end of August. Jim Keating, executive director of the Blaine County Recreation District, said the work this summer will cover the southern half of the 20-mile-long path. It will begin at the southern end of the trail at Gannett Road, south of Bellevue, and proceed to East Fork Road, north of Hailey. The northern half, from East Fork to Hulen Meadows north of Ketchum, is scheduled for summer 2015. Keating said the work will be done in one- to two-mile-long segments, which will be closed to users as the work is carried out. He said daily information on the closings will be posted on the Summer TraiLink portion of the district’s website, and will be available by calling the district’s Trails Hotline at 578-9754. He said the schedule cannot be predicted with certainty. “Weather is always an issue when you’re laying asphalt,” he said. Blaine County voters passed a two-year, $1.75 million property tax levy in May 2013 to fund the resurfacing work. The Recreation District proposed the levy in response to a report compiled by Galena Engineers that the trail is experiencing “alligator cracking” (cracking in a web pattern, mostly on the edges of the trail surface), horizontal cracks and cracks in patching material that has been used to fill previous cracks. The report states that many of the problems are occurring in the first four miles of the trail north of Ketchum, which was the first segment of the trail to be built, in 1984. The project is beginning at the southern part of the path because there has been less deterioration there and it can be repaired for less cost if that work is done soon. Keating said repairs there can be done by milling the base and reusing that material, while the more deteriorated northern section will have to be covered with new material. Part of this summer’s work will be to shift a retaining wall at the southern end of the tunnel south of St. Luke’s Wood River hospital to realign the entry there. A $1.3 million contract for this year’s work was awarded to Idaho Sand and Gravel in mid-January. Keating said that as long as no additional, unexpected work is encountered, the $475,000 difference between the contract amount and the levy proceeds will be carried over to next year’s work, which is likely to be more expensive than this year’s.